He was born in Tianjin in 1968 and graduated from the Art Faculty of Tianjin Teaching University in 1992. He continued his study and research at the National Art Academy from 1993 to 1995. Since his early days, He was actively engaged in painting and writing. In 2008, He had his first solo art show in Beijing. Between 1999 and 2015, He had participated in more than 30 art exhibitions and events in major cities in Mainland China, Hong Kong, Macau, Taipei and abroad, including Singapore, Korea and Malaysia etc. He is currently the Deputy Principal of Tianjin Binhai District Art Academy. Through the years, He’s works of art had received substantial awards and honors. 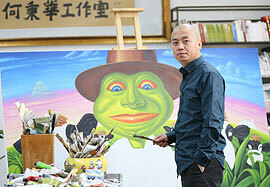 He is also an art critic with his own column in many leading art magazines and newspapers in China. As an art curator, He had orchestrated more than 30 art shows in the past decades.